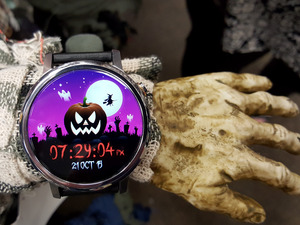 Microsoft wants you to make Bing your go-to resource for this year's Halloween festivities. Bing is frightfully excited for Halloween on Saturday. To celebrate, Microsoft’s now profitable search engine has rolled out a number of tools to help make your Halloween just right. What, you want more? Microsoft additionally created a horror movie trivia game for Bing-powered Cortana on Windows 10, Cortana for Android and iOS, and Windows Phone. Finally, there’s also a surprise for the ghastly day itself that Microsoft is keeping under wraps. Here are the gory details. Using Bing’s image search for “Halloween costumes for adults” or “Halloween costumes for kids” you’ll get a long list of dress up suggestions and even links to buy—though it’s getting a bit late for online shopping. 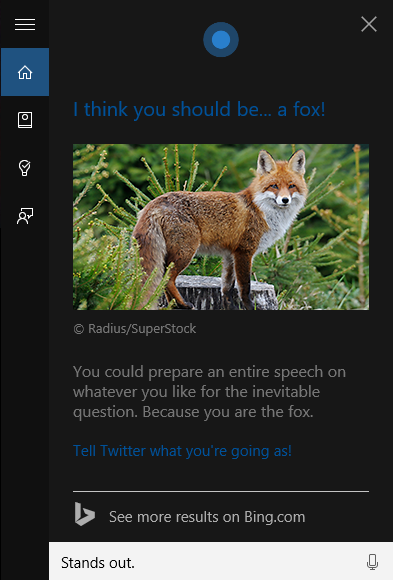 You can also ask Cortana “What should I wear for Halloween?” using the assistant’s voice search capabilities—it doesn’t work when you type out the phrase, however. The digital personal assistant will then ask you five questions to narrow down costume ideas to a single, probably lame, suggestion. Google also recently got into the Halloween spirit with a Trends feature that shows you the most searched for costumes in your area. That way you have a better chance of avoiding an appearance as the second, third, or fourth Batman at your Halloween party. 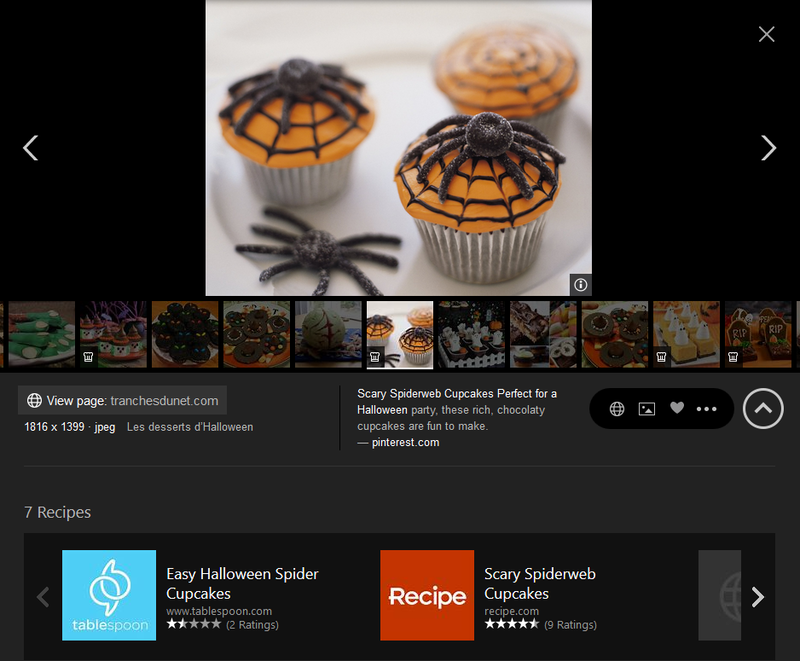 Halloween dessert search on Bing. Similar to the costume search, if you look on Bing images for pumpkin carving help such as “easy pumpkin carving” or “celebrity pumpkin carving” you’ll find lots of examples and resources to get your started. The same goes for using Bing image search to find Halloween desserts. If you see an image result with a little chef’s hat in the lower left corner that means there are recipes Bing can show you related to that image. Use a regular Bing search for “top horror movies” and you won’t get any sleep Saturday night. Be careful as that also means you’ll miss out on the extra hour of sleep thanks to the daylight savings switch early Sunday. You can also opt-in to a new Halloween-themed look to Bing Maps, which is active right now. Go to Bing Maps, click on the drop down menu in the upper right corner (it should have “Road” selected by default) and then choose Spooky. Finally, Bing says it will also have a “spooky treat” for everyone on the Bing homepage on Saturday. A sneak peek will be available on the Halloween Explore page on Friday.